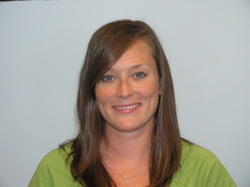 Kim graduated from Lenoir-Rhyne College in 2005 with a Bachelor of Science degree in Occupational Therapy. Upon graduation Kim began her career as occupational therapist in a pediatric clinic specializing in sensory integration. Her experience includes working with children diagnosed with autism, cerebral palsy, Down syndrome, developmental delay, behavioral issues, sensory processing deficits, ADHD, feeding aversions and coordination disorders. Kim is also a S.I.P.T. certified therapist. She has served the special needs community in the clinic setting as well as in the school setting. Kim is also an active participant in Autism Awareness. Kim has a genuine passion for working with children in need of occupational therapy. Her creative approach during treatment, along with her extensive clinical skills help children meet their goals to promote their success at home, in the classroom, and in the community. Kim provides her clients’ families with detailed and relevant information pertaining to fine motor and visual motor goals, self care goals and sensory processing goals. She implements a fun and child directed approach during treatment that keeps the child motivated while acquiring new skills. Kim takes true delight in seeing her clients reach their goals and master new tasks. In her spare time, Kim enjoys cooking, spending time with friends, running and reading a good book.